He gave €250 to the ISPCA after a court case. A DONEGAL MAN had admitted to illegally removing the dew claws of a St Bernard puppy, and has paid €250 to the ISPCA after a sitting at Letterkenny District Court earlier in the month. The cruelty came to light when the puppy was bought for €800 in June 2015. The new owner soon became concerned as the puppy was showing signs of discomfort. The puppy, named Nala, was brought to a local vet who discovered that there had been a botched attempt to remove her dew claws. This had resulted in a partial nail growth that was deformed and painful for Nala. She required surgery to prevent future pain and suffering. The ISPCA were alerted about the incident, and senior inspector Kevin McGinley investigated the matter. The court heard that McGinley contacted the man who had bred and sold the puppy. It heard that the man had removed the dew claws of all nine St Bernard puppies in the litter when they were three days old. The breeder said the removal of the dew claws “was part of the service he provides when he agreed to provide the stud dog”. The court also heard how a set of curved scissors was used to carry out the procedure in a back garden. The puppies had not been sedated. McGinley said: “The ISPCA does not tolerate any form of animal cruelty, neglect or ill-treatment of animals and the removal of dew claws purely for cosmetic purposes is not only illegal but this sort of horrific mutilation provides absolutely no benefit to the animal. This is the first successful prosecution in the removal of dew claws under the current legislation and breeders need to be aware that performing this act of cruelty is a criminal offence under the Animal Health and Welfare Act and can have serious consequences. Email “Donegal man admits illegally removing the dew claws from a St Bernard puppy”. 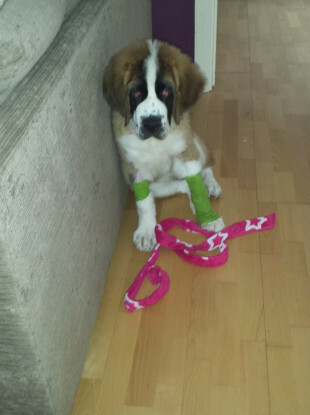 Feedback on “Donegal man admits illegally removing the dew claws from a St Bernard puppy”.